Windows© 9x (32), Xp (32 or 64), Vista (32 or 64), Seven (32 or 64), 8 (32 or 64)... WINe Cellar cannot be run on DOS or an OS in 16 bits. Attention with SP1 for Windows 7, see F.A.Q #10. If problem you must run "WINe Cellar" in "Windows Xp SP3" (for Seven) or in "Windows 7" (for Windows 8) compatibility mode and / or in "Administrator" mode. WINe Cellar - management of a wine cellar. WINe Cellar : Your personal sommelier. Whether you are a connoisseur of fine wines or occasional consumer, you've always dreamed, to have a well supplied cellar. Can you ever be one of those happy owners of a cellar worthy of the great houses which combines Sauternes, Saint Emilion, Pauillac, Beaune, Chablis ...? Even if not yet the case, the software "Wine Cellar" will be of great help. 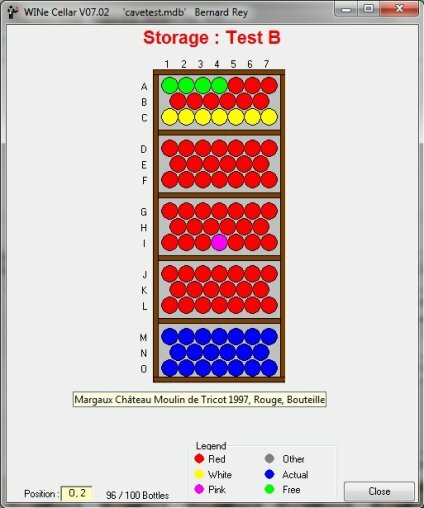 This very French software allows you to manage efficiently inputs and outputs of bottles, knowing the composition and value of your cellar and when to consume wine. - This screen shows in the left part the drop-down menus of the application, in the right, functions buttons of frequent use and in the center a modifiable image which proportions matter little because it is possible to "stretch" the screen for better sight. 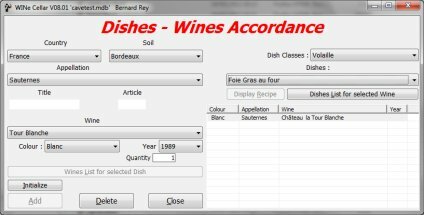 Wine input data - Fields such as country, soil, colour, appellation, title, vineyards etc, have to be typed only once: if they do not exist. Otherwise they are to be selected in the dropdown list. To avoid errors, these fields are hierarchical. The Soil depends on the Country, Appellation on Soil, Wine on Appellation. The "title" and "article" are separated from the name of the wine to allow adequate classification of wine names. - The background image is optional, the colors of the titles can be modified for easier reading and you can change the screen size to your liking, the position and dimensions are stored to be reused. - Storage of the bottles can be deferred. You can make all the entries and then with the list "wines to store", you can store your bottles. 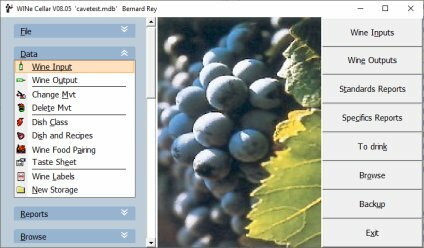 - When you are creating a new Wine, a specific screen will allow you to manage the grape varieties. 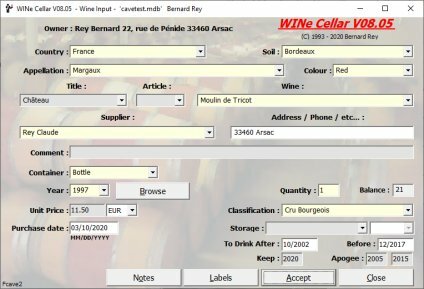 Wine output data - Fields such as country, soil, colour, appellation, title, vineyards etc, must be selected from the dropdown lists. Also on this screen, the Soil depends on the country, Appellations on Soil, Wines on Appellation. - The background image is optional, the colors of the titles can be modified for easier reading and you can change the screen size to your liking, the position and dimensions are stored to be reused as in the previous screen . Taste Sheet - First, select the Wine (Country, Soil, Colour, Appellation, etc...). 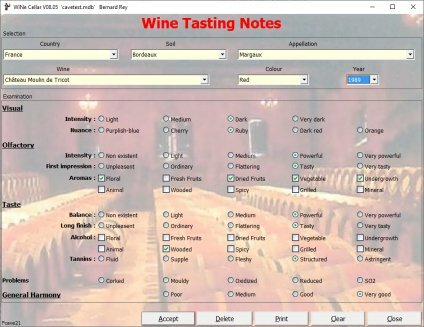 If a taste sheet exists for this wine, already entered data will be displayed. It is possible to print blank sheets. Relations Dishes - Wine - Select a wine and a dish then add the relation. View a wine - Select a wine and you will have access to all its informations. Events of a wine - You have access to the list of all inputs and outputs of selected wine with a balance at the end of each month with event and at date of day. 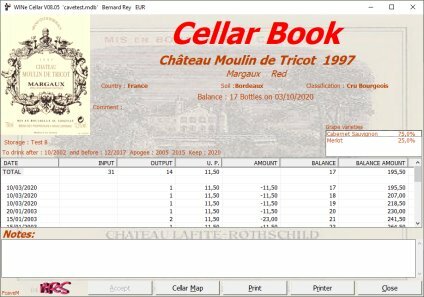 Cellar Book - In addition to the list of the movements wich comes from the most recent to oldest, the wine has its values, stocks and you can print a page of Cellar Book that can eventually be kept in a folder. Reports - 12 pre-defined reports with some columns to choose and a host of reports obtained from very fine extraction criteria. All reports are formatted printable and exportable into a spreadsheet or XML. Summary - 3 lists, by colour, year and name. The price and quantity if the price per unit has been informed. Storage - With a little skill you can make the storage looks like yours. You can then save your bottles, move them (without breakage!) into storage or between 2 storages by simply dragging and dropping. Neck Labels - So you do not move the bottles to see the name of the wine, you can print collarettes that once cut will be passed around the neck. You can use eight languages: French, English, Spanish and with automatic translation by Google, German, Dutch, Italian, Portuguese and Catalan. If you need and if you can, it's possible to add more taking existing files in example. If you add or modify files, please send me a copy to centralize them. 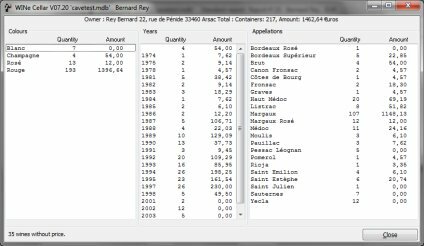 Existing files are: "French.lang", "English.lang", "Spanish.lang", "German.lang", "Dutch.lang", "Portuguese.lang", "Italian.lang" and "Catalan.lang" in WINe Cellar directory, all are text files editable with programs like Notepad. If you need help to understand these files send me an email. 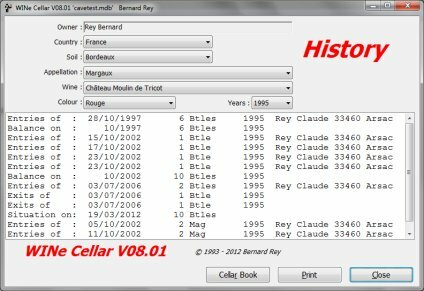 You can download WINe Cellar software for free and try it during one month before purchase if you like it. You have downloaded the software, tested and decided to buy it. After payment you will receive an email to download a file you have to run. Your software is now unlocked not only for acquired version but for all the "releases" of this version. That is, for example, that if the purchased version is 8.05.0230, all updates are free for 8.05.nnnnn but not for a 8.06.nnnnn version. Like the previous version with in addition all updates for free. As for the Internet version, plus a CD-ROM or DVD-ROM at your name recorded in Multisession that lets you add backup and updates, with a printed bound manual. 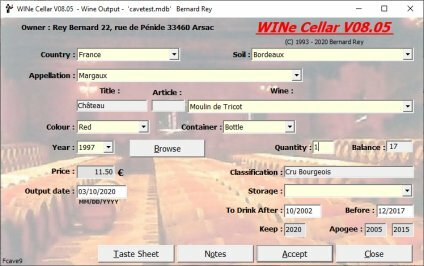 Buy WINe Cellar to have a full use of the software. Buy it at a low price: cheaper than a good bottle of your wine cellar. Copyright © 2011 - 2019 Bernard REY . All rights reserved. Design by: Bernard REY for: himself. Updated on February 11, 2016.